SAM Collins and Stephen Pears have taken temporary charge of Hartlepool United, the club has confirmed. It follows the departure of former manager Colin Cooper who resigned from his job after the 3-0 defeat to Carlisle United on Saturday. The defeat left Pools at the foot of Sky Bet League Two with just eight points from a possible 33. It was widely expected that Collins, 37, would be stepping up to caretaker boss but the club has confirmed assistant manager and goalkeeping coach Pears will remain at the club. The pair - who took a training session at Maiden Castle, in Durham, this morning - will be in charge for the Johnstone’s Paint Trophy match with Sheffield United at Victoria Park on Tuesday night (KO 7pm). A statement on the club’s website read: “The club can confirm that Sam Collins and Stephen Pears will look after first team affairs on a temporary basis following the resignation of Colin Cooper. 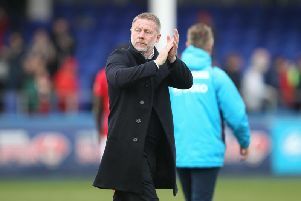 “Cooper stood down as boss after eighteen months following Saturday’s 3-0 defeat to Carlisle United at Victoria Park left Pools at the foot of the League Two table.